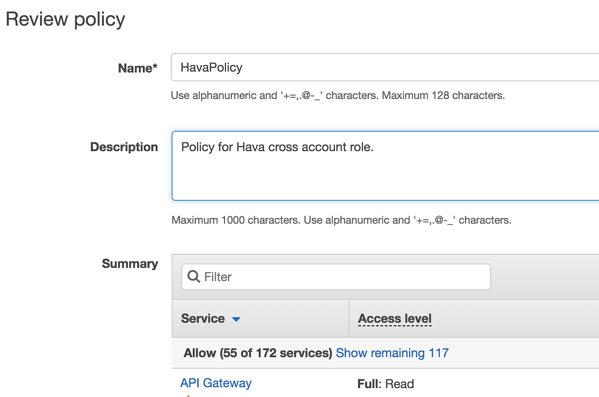 Follow these steps to create an AWS cross account role with custom policy that will allow Hava just enough access to draw diagrams of your infrastructure. In Create Policy, copy the policy details below in the JSON tab. If there are certain permissions you don't want Hava to have then feel free to remove them - Hava will only import and display resources it has permission for. Once you're happy with the details click Review Policy. Give your policy a name such as HavaPolicy and a description. Go back to Create Role, refresh the policies list and search for the policy you just created. Review and create your role. Bang! In the list of Roles, select the role created and copy the Role ARN value. Jump back to your Hava account and enter this into the Role ARN field, then click Import to get started!